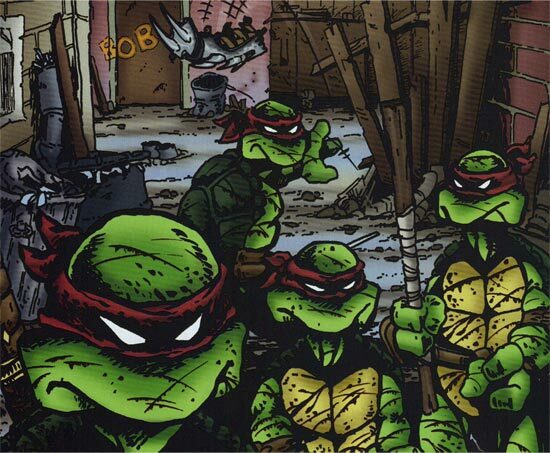 Although there are many differences between the various iterations of the TMNT franchise, one of the things that does remain constant is that they are based in the sewers of modern New York. Thats fine, but as I dont play very many “modern” games I dont have a lot of modern scenery and the like. That means that getting a TMNT game off the ground requires lots of work before I can even start. 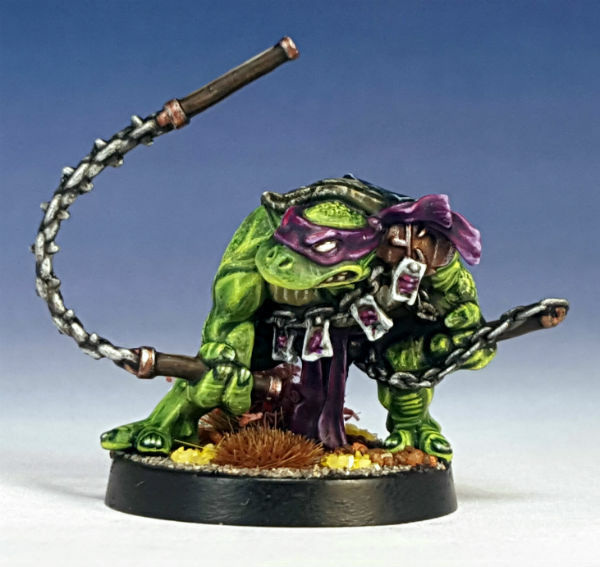 One of the two sets of TMNT miniatures that I have stored away for when I get that anthropomorphic amphibian urge is the set of not-TMNT from Greebo Games. 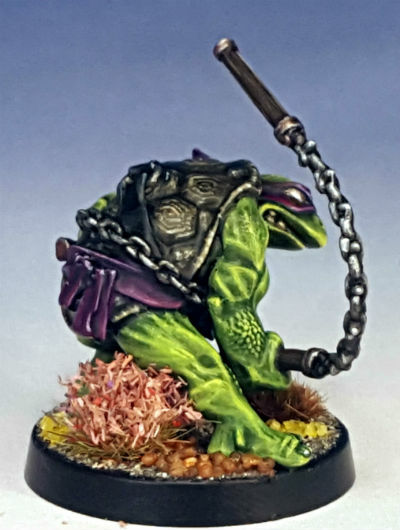 They are nice sculpts of a more feudal Japanese take on the TMNT, so the not-Donatello model is sculpted with what I think are called “malas” (prayer beads) for example. Similarly not-Mikey here has shinto “ema” prayer cards attached to his outfit. This look, although executed well on the figures, isnt exactly what I want from a set of modern TMNT based in New York, so I wasnt sure what to do with the models: they were not quite what I was looking for. And then this year, all of a sudden I started painting my Shonen Knives force of ninja and samurai for Frostgrave. I subsequently remembered that I had some feudal Japanese TMNT waiting for some love and my plan fell into place. The Shonen Knives were painted in black and purple to vaguely echo the “Foot Clan” ninja as shown in the original TMNT cartoon. At some point in the future I plan to use those ninja models in modern TMNT games, so it made sense to have them suited to both that role and the fantasy games that I have initially worked on them for. So I decided to fold the TMNT into the Shonen Knives, making them an elite unit in my planned Dragon Rampant force. The Shonen Knives are a bit more Lawful Evil than the traditional TMNT (Lawful Good). As I am already shifting the Heroes in a Half Shell from 21st century New York to imaginary-fantasy-feudal-not-Japan, I figured that making them bizarro versions of themselves wouldnt be much of a stretch. 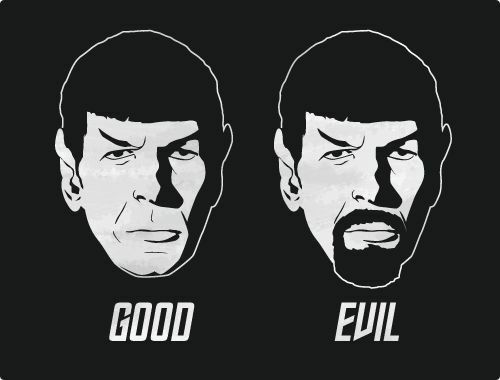 I drew the line at giving them beards though. In the original TMNT comics, the four turtles were only visually distinguished by their armament, they each wore a red mask. When the franchise went from teenage boys comic to mainstream TV the turtles were each given a signature colour used on their masks (and occasionally other trappings). That pattern has been used ever since, although often in reboots, initially the boys uniformly wear red masks for a short period. Michaelangelo – yes, Eastman and Laird did spell “Michelangelo” incorrectly – more commonly known as Mikey, is The Heart/Plucky Comic Relief on the team. He wields two pairs of nunchaku. He wears an orange mask. I broke the rules and painted this Mikey with a purple mask. 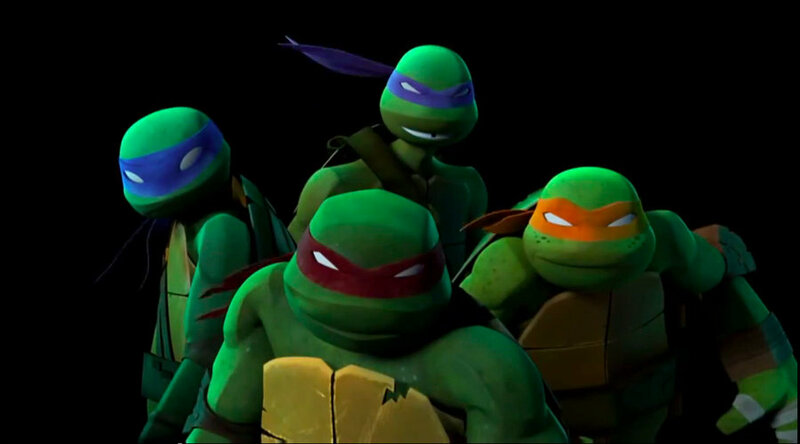 All of this group of TMNT will wear purple masks to tie them in with the Shonen Knives. Additionally its a pleasing nod to the “uniform” of the original red mask era and also visually suggests their bizarro natures. A big ol’ “COWABUNGA!” goes to Greebo Games for the design and sculpting on these figures: they are really nice models and I recommend them heartily. They are digital sculpts cast in metal. Very few manufacturers have pulled that off with as much panache as Greebo have done with the four boys. The Statuesque Miniatures range for Pulp Alley is the only company that I can think of that manages digital to metal as well. More Teenage Medieval Ninja Turtles next time. Now that is cool – I love that sculpt, he looks almost prehistoric, and is way more intimidating as a result. Lovely paint job and a cracking addition to the knives. There is a fair bit of Eastman and Laird in the design, in addition to a unique and more medieval approach to the equipment. I think that Mikey fits in well, Im glad that you like him Alex, thanks for the feedback. As a member of the Gesamtkunstwerkobots I transform from robot mode into a giant chin being stroked. I become the laft armpir and mullet of the gestalt form, Mashupinator. Im glad that it made sense David, it was a little bit long for a post about a single model, but I wanted to get the reasoning explained. It looks like it worked 🙂 Thanks for the feedback! This is great! Nice looking models. I loved the cartoon as a kid and collected all the toys. The phenomenon hit over here a bit later, when I was in my teens, but I was aware of the toys. 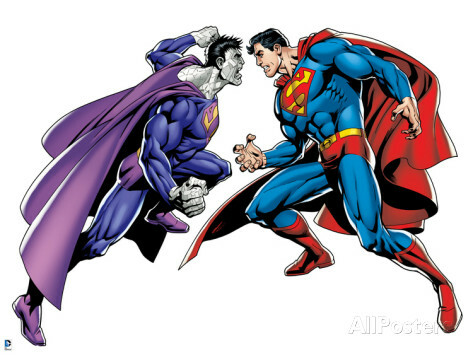 I read reprints of the early comics around then and liked them. I have enjoyed various iterations more than others (the “TMNT” movie in 2007, the current Nickelodeon show), but something about the franchise has long appealed. Holy crap! These are too cool. I disagree that they wouldn’t fit into “modern New York”, as the turtles have appeared in a lot of different incarnations even within the original books, sometimes quite “atavistic” like these are. But this guy looks great and I think they’ll fit into the Shonen Knives really well. I actually have a (somewhat worn) set of the original Ral Partha ninja turtle figures, but whatever one might say in favour of the old school… these are way cooler. Thanks No Such Agency. They are pretty nice sculpts. They’d be hefty in 15 mm scale. They’re true old school 25’s, less than human height but still about 20 mm tall. I was going to say that; the Turtles can fit in any ambientation you wish. The sculpt here is great, the edgy nature in it remarks the goofiness, an that’s what makes them so versatile. But, woah, the way you painted this! Absolutely awesome!! The slightly more “grimdark” look to this incarnation of the TMNT does suit better here. There are at least three more of these due in the medium term. Fantastic paint job, and figuring out a way to shoehorn useful figures into your game is always great too. Thanks for the feedback Lasgunpacker! Excellent paint job as always. 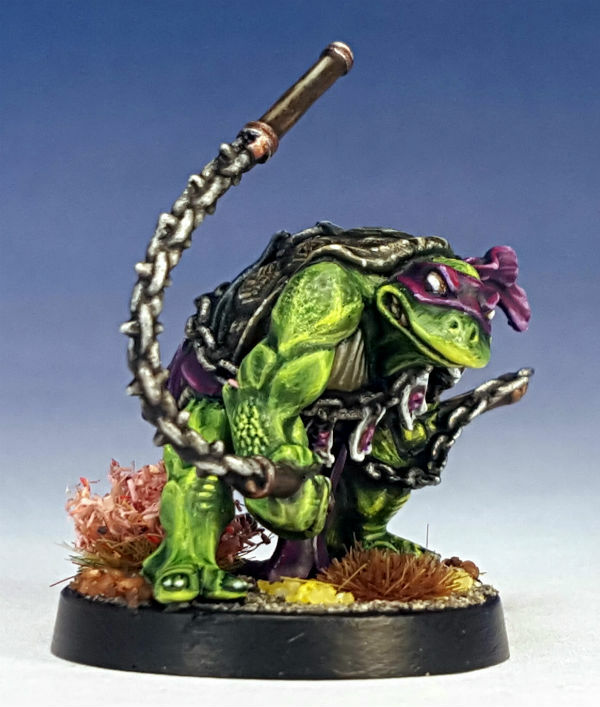 I do enjoy the brutal look of the turtle, more edgy, more grimdark. Somehow I think this is the feeling the latest Turtle movie wanted to convey, but failed. Not so your rendition in miniature. Reminds me actually of the old NES game in terms of style. Memories of the German version of the intro lyrics are brought to the fore! Kind alike the English ones better, but hey, Frank Zander’s voice was cool at the time.